Arthro-7 Healthy Joint Support promises to help users reclaim their mobility. They suggest that within just 2-weeks users will notice a difference and the many benefits include nourishing joint cartridge, supporting joint health, relieving discomfort and promoting mobility. The formula is all natural and has been used for over 20 years. They provide a special 3-month joint-health program. For more information and to ascertain whether this is as effective as the manufacturer claims, read on. The recommended dosage is to take 2 Arthro-7 tablets twice daily with a full glass of water, once in the morning about 15 minutes before breakfast and take another 2 tablets again about 1 hour before bedtime. Anyone who is allergic to shellfish or soy should not take this product. As with any supplements, you should consult your healthcare practitioner before taking this product especially if you are pregnant, lactating, taking any medications, have food allergies, or if you have any medical conditions. 3-month supply (210 ct)costs $99.90 plus $12.95 shipping and handling. There are several freebies to be had when ordering different packages. With the 3-month supply, consumers receive a free booklet and some pain-relief topical cream. We could not find any clinical evidence to support the effectiveness of the cream so we remain a little in the dark about this product. Arthro-7 is sold with a 60-day money back satisfaction guarantee, as stated on the official product website. However, the policy is slightly different depending if consumers purchase a 1,3 or 6 month supply. For further details, we recommend that potential purchasers check out the website to ascertain if they are comfortable with the returns policy prior to purchasing. We found many positive reviews suggesting that this product works well. In fact, all were so good that we wondered how realistic it could be for a product to work so well on everybody that tried it. We would like to have seen more balanced reviews to be able to ascertain its true effectiveness. As we all know, supplements work differently for each one of us, so some negative reviews aren’t always a bad thing if it helps us understand the reasons behind them. Over all, this is a relatively good product. It contains some key ingredients for reliving joint pain and improving mobility. The manufactures provide some good free products with the product and the price is pretty much on par with other similar products out there. We value their 60-day guarantee because it really lets consumers try the product out. We were however, disappointed that Arthro-7’s formula doesn’t include more key ingredients that support cell regeneration and function such as Glucosamine Sulfate or Chondroitin Sulfate. We liked the fact they offer options for different package deals but felt that managing long term optimal joint health can take time, so a 6 month package options would have been good to see, allowing consumers to save even more in the long term. Just a few changes could boost this products effectiveness and popularity. 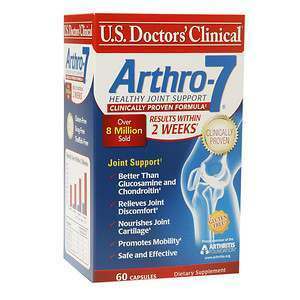 Mark Stevens	reviewed Arthro-7	on April 7th	 and gave it a rating of 3.5.